Please pave all of Spring Street before putting down more “green material.” The bike lane should be on a paved street, not that broken concrete. Is that too much to ask? This is fantastic! We’re getting closer and closer to having a real backbone network throughout all of Los Angeles. 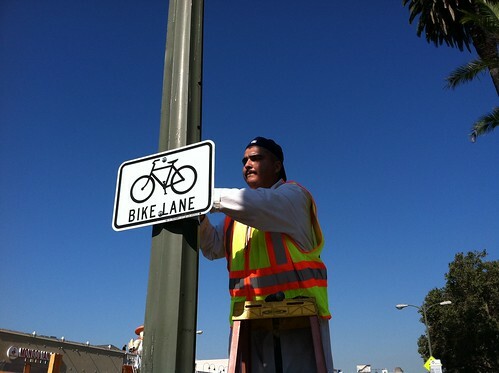 Job well done LADOT. Great, expand upon your dumb poorly executed idea. 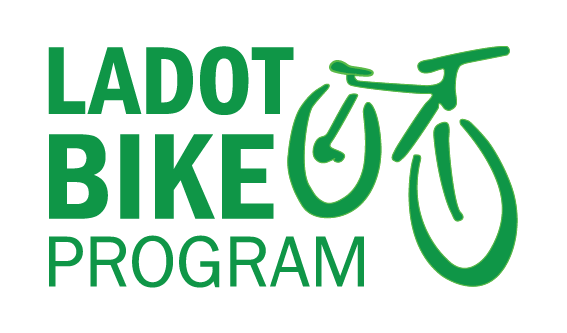 Little by little, step by step Los Angeles is getting better and better for bicyclist….good job to ALL (advocates, bicyclists, local communities, some council members, the mayor and LADOT) involved! Just keep those bike facilities coming! On the one hand hearing about all the changes is kind of frustrating, but on the bright side, I’m glad LA DOT is experimenting as they go, rather than waiting and waiting for some kind of perfect standards. The old adage, “don’t let the perfect be the enemy of the good” comes to mind. Does “green material testing mean” trying out different types of paint? Have you found a new type paint that works on broken concrete? I assume the long range plans include repaving main and spring and installing better bicycle lanes or cycle tracks. Any progress being made on that front? Any way you can give an more precise update on the NB lanes north of 9th? How much longer after the design phase will it take to get paint (or thermoplastic) on the streets? L.A. Streetsblog and LA Eco Village’s blog have written – and taken pictures of – the Venice Main St. project. We are planning on making a video sometime in the near future. As for Downtown, the northbound Main St. lane is currently in the design phase. It is a high priority project, so it is moving rather quickly. We’ll have posts in the future that will have a more accurate timeline for when the lane will go in. Thanks for commenting! I did some volunteer work for LACBC at 6th St. and Spring St. from 4-6 Pm Thursday looking for violators of the green bike lane. The traffic flowed smoothly on Spring St with only 3 or 4 times when it backed up for a block. Traffic was moving slow enough for a skateboarder to feel comfortable manuevering down the green lane. After darkness, there was a person just learning to rollerblade and three people casually riding side-by-side without reflectors or lights. Most people were riding in the street, rather than the sidewalk, but there was probably only one female cyclist on Spring St. in the two hours. Then again, there was considerably less than a 50% mix of female to male pedestrians. Other than the green paint not sticking to the street and some rough patches of street surface, I’d say that the Spring St. bike lane is about as well done as you can expect for a completely unprotected bike lane. It would be better to have some barriers for protection from buses and cars, but the slowness of the traffic should reduce the frequency and severity of collisions. On page 5 of this pdf, from the City of Chicago, there are two locations where the city has placed a buffer on both sides of the bike lane. These would bring the cyclist further away from the parked car doors that swing open, but it would also make it less comfortable and noiser for the cyclist by reducing the distance between the moving vehicles and the bike lane. Since the moving vehicles are by far the greatest concern for the vast majority of people who would consider cycling, then I’d prefer the design of Spring St. with the entire buffer separating the moving vehicles from the cyclist. Fantastic, now let’s extend the lane all the way up Main Street into the Civic Center, so that it’s not just a one way ride. Hopefully, they will place the northbound lane on the left side of the street to minimize conflicts with buses traveling along Main St. As it is on Spring, the buses have to cross the lane quite frequently, and occasionally appear to simply ignore it.